Having FUN, Making FRIENDS, and Learning the FUNDAMENTALS. Come join us to help get you to the pro tour: Dejon Bivens is currently on ITF pro circuit!!! Elite Orange & Green ball training. CALL US FOR A FREE TRIAL CLASS! Programs designed for neighborhood residents and Tennis Club members that focus on the fundamentals of tennis, current teaching styles and a great atmosphere that encourages fun for juniors and adults in their respective classes. 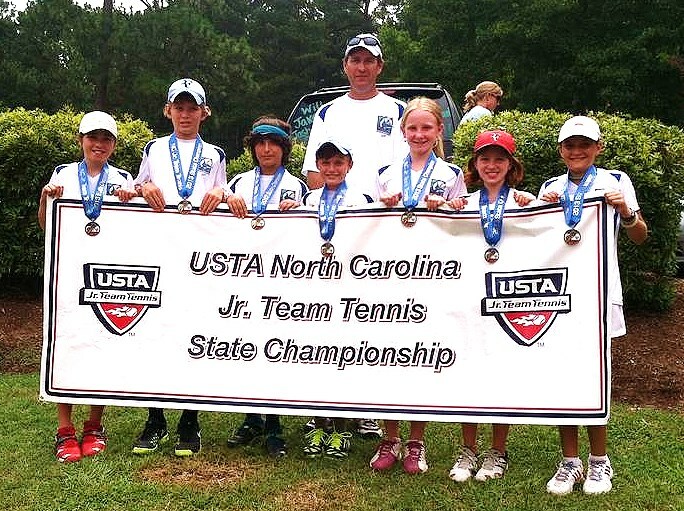 Trimp Tennis Summer Camps have been going strong for over 10 years with an exciting mix of tennis, swimming, and other sports with a focus on fun, friends, and fundamentals. Every enrollment participates in a daily warm-up activity/game and then they are split up depending on either age group and/or skill level. The rest of the half-day camp, we focus on a tennis activity that has a specific theme/topic of the day. All Half-day camps run from 8:30-11:30am. Tennis only. 8:30-3pm. Activities include: tennis, swimming and adventure games.